Welcome to my practice. 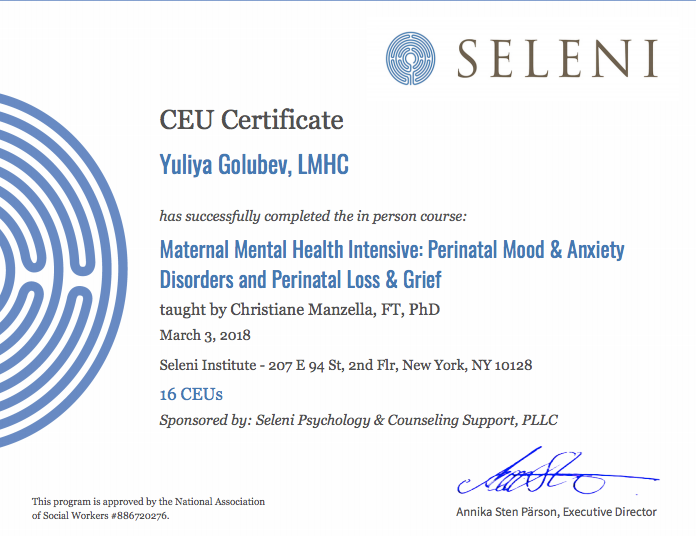 I am Licensed Mental Health Counselor in the state of New York. I obtained my Bachelor in Psychology and Master in Mental Health Counseling at the City University of New York. I am also Credentialed Alcoholism and Substance Abuse Counselor (CASAC). I was trained in Psychodynamic, Cognitive Behavioral, Gestalt, Marital/Family Therapy, and Internal Family approaches. I also specialize in Maternal Mental Health. I have over 10 years of professional experience providing therapy to the diverse population of Brooklyn and Manhattan. I've worked in a variety of settings: outpatient substance abuse clinic, residential facility, hospital settings, college counseling, and crisis call center.